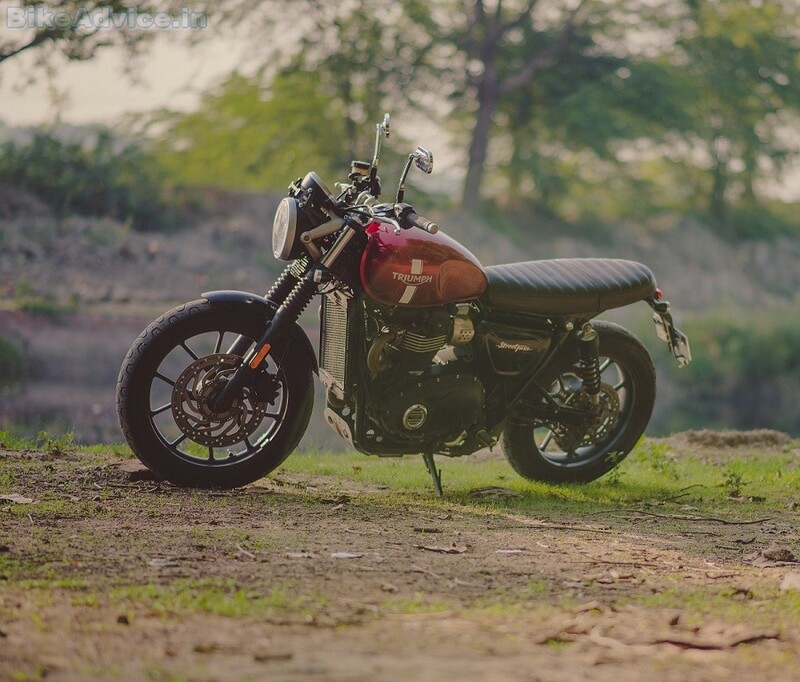 This, the Triumph Street Twin review, could have very well been a pictorial review, and I am sure you wouldn’t have complained. Because, correct me if I’m wrong, not only are the pictures our best yet (they are, right? 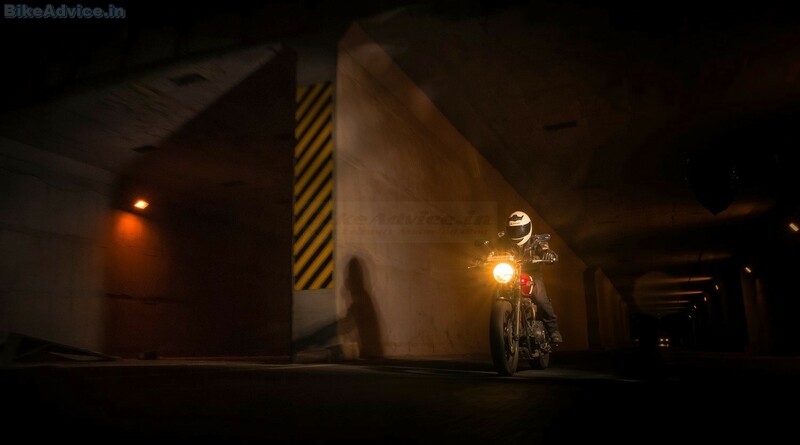 Ducati Scrambler’s come next, in my opinion), it is also perhaps the first time that anyone from Indian automotive media has taken motion shots way after our side of the planet has turned its back towards the sun. It wasn’t easy, and I’ll try to bring to you the raw video footage of behind-the-scenes action. As of now, let me just tell you that for just these two shots, we started from our respective places at 11 pm, and could only come back at around four in the morning! This is what motorcycles do to you. Beautiful motorcycles, especially. They make you test your limits; they make you go beyond. And I already did tell you in my Bonneville T100 review about how much I have been lusting after the Street Twin ever since its launch last year. Sure I got the bike quite late in the day, but the good guys in Triumph PR and Corp. Comm. (all of them are bike guys, and therefore aren’t stuck in the wrong job unlike some of their contemporaries who cannot even ride) made up for it by letting me keep the bike for an unprecedented amount of time this once. And that’s one of the benefits (getting to keep the bike for a decent duration) of taking the bike after everyone has had a go on it. The second benefit is that such a bike, by the time it comes to you, would have been ridden so mercilessly by most auto journalists and bloggers that, take my word for it, no owner’s bike will ever see even one-tenth of that kind of abuse in its entire lifespan. Which means that whatever rating or verdict we give to such a motorcycle after analyzing all the test data, a customer’s bike will always be a notch better, period. So let’s get on with it, shall we? I’ve said this earlier and I’ll say it again: Triumph make some of the most gorgeous motorcycles in the world under their Modern Classics range. And the Street Twin, despite being the cheapest Triumph you can buy, is up there with the most beautiful Triumph of them all – the Thruxton R (with the Track Racer kit). But, where even the Thruxton R is dependent upon an accessory kit to look its best, the Street Twin needs no make-up before stepping out. This motorcycle is like those rare women who are not fully aware of how beautiful they look in their natural avatar. That is why I was rather disappointed to see our test bike splattered with accessories from the company’s enormous catalogue. 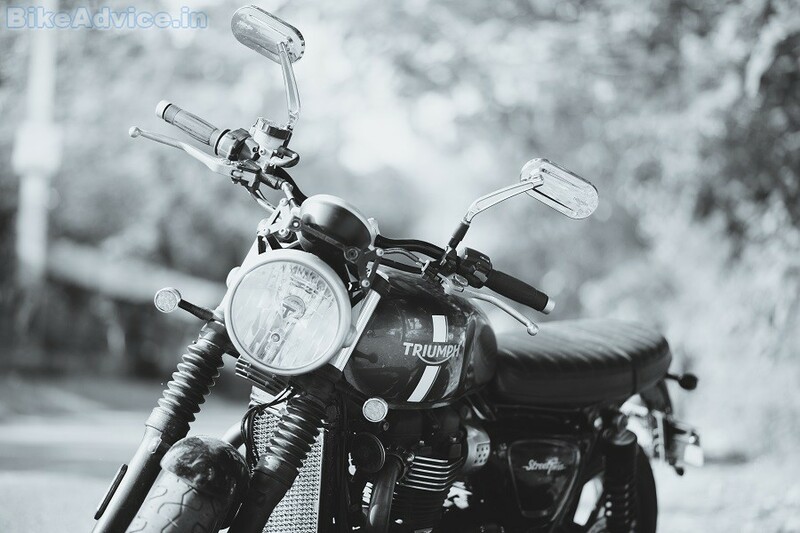 No Triumph, I don’t need that 2-into-1, Vance & Hines scrambler exhaust system on the Street Twin; I have heard the stock ones – they sound bloody good! Yes, this one saves weight and it might also be packing a couple of extra ponies, but if I were that conscious about saving weight; its impact on handling, and horsepower, I would save more and buy the Street Triple or the Ducati Monster, thank you. 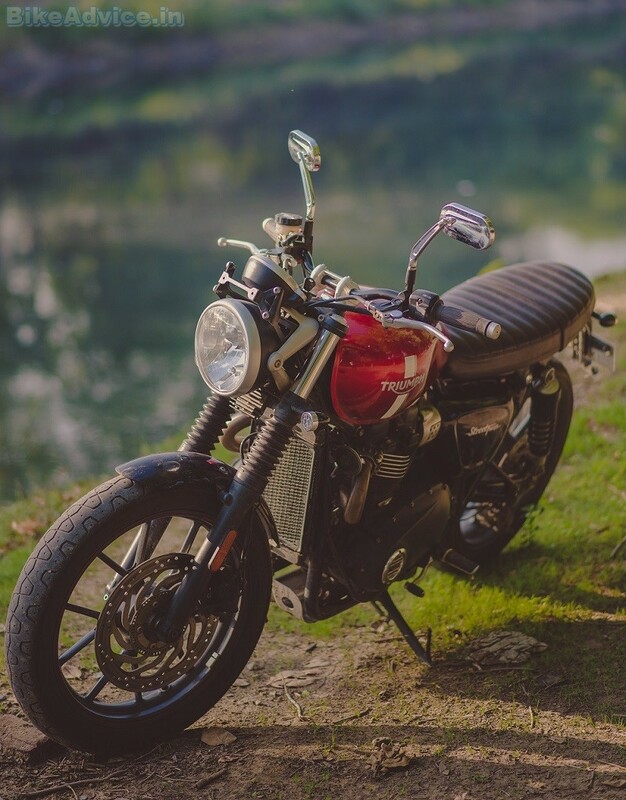 See, there is something so irresistibly sensual about motorcycles with a round headlamp, twin pipes, short fenders, a straight-but-slightly-stepped saddle, and a reasonably wide handlebar that messing around with this combination is borderline sacrilege. So don’t. Of course, if you’re someone with tattoos and jewellery, you may individualize your Street Twin by choosing from the 129 accessories that Triumph offers for this motorcycle in that aforementioned catalogue. If you ask me, bar-end mirrors would be the only accessory I would buy for my Street Twin as I found the stock mirrors (one of the test-ride bikes at the showroom had those, whereas mine had these beautiful oval-rectangular units, again from that accessory list) to be almost useless. Bigger guys won’t be able to see a thing in them other than a part of their own selves; that’s good then for the narcissists. The mirrors on my bike were good, but the bar-end ones should be even better at keeping a track on what’s happening behind your back. Plus, their aesthetic value carry the power of making you feel good about life even if you’re a vegan ogre. And this HAS to be the friendliest motorcycle for short people. A saddle height of just 750 mm is lower than even the Honda Navi’s (765 mm). Heck, it’s even better than – wait for it – the Harley-Davidson Iron 883’s (760 mm)! So if you’re one of those who never liked cruisers but were forced to choose from them only because of their low seat height, you can say goodbye to them now. My bike had one of the accessory seats so it didn’t have the lower step for the rider that the standard perch offers, but I was still able to put both my feet down comfortably despite Mr. Vance & Hines causing me to, er, spread my right leg a little more than normal. Of course, that exhaust does get hot; what else do you expect from a chimney that’s directly attached to one of the hottest furnaces invented by man? You should stay away from motorcycles if you thought otherwise. 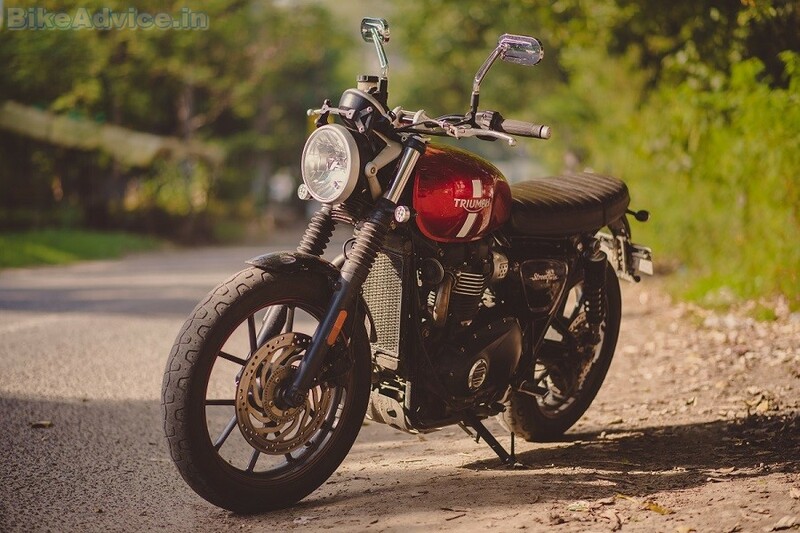 That said, if I was able to commute daily on the Street Twin, that too in peak Indian summers, without burning anything, I see no reason to stop you from getting one if you really want it badly. The only real disadvantage, other than the looks (but that’s completely according to my eyes), is that this exhaust renders the Street Twin a single-seater, so you can’t take your better half for a ride on it. Not a problem if you ride solo, and definitely recommended if you hate people, because it’s loud, but only when you want it to. At all other times you can putter around without scaring anyone. Blip it only to clear the garbage; okay, the technical term is jaywalkers. 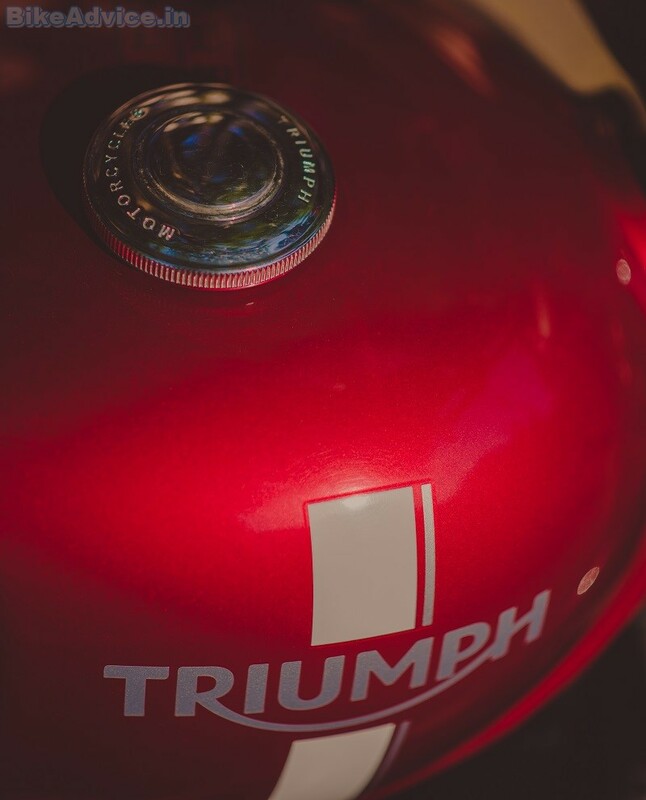 And while this might come as a surprise to you but the most beautiful part of this motorcycle for me is the engine, and I am not at all talking about its behaviour or torque right now; I am referring to just the design and aesthetics at the moment. Just look at those beautiful fins, and how impeccably they have been finished; you’ll also admire the ‘flower nuts’ if you’re a nutter (Jawa fans will understand; for all others, I am referring to the ring nuts of the exhaust headers), and then you’ll also appreciate the symmetrical placement of those bolts on the cylinder head, in tandem with the cam cover – beautiful! 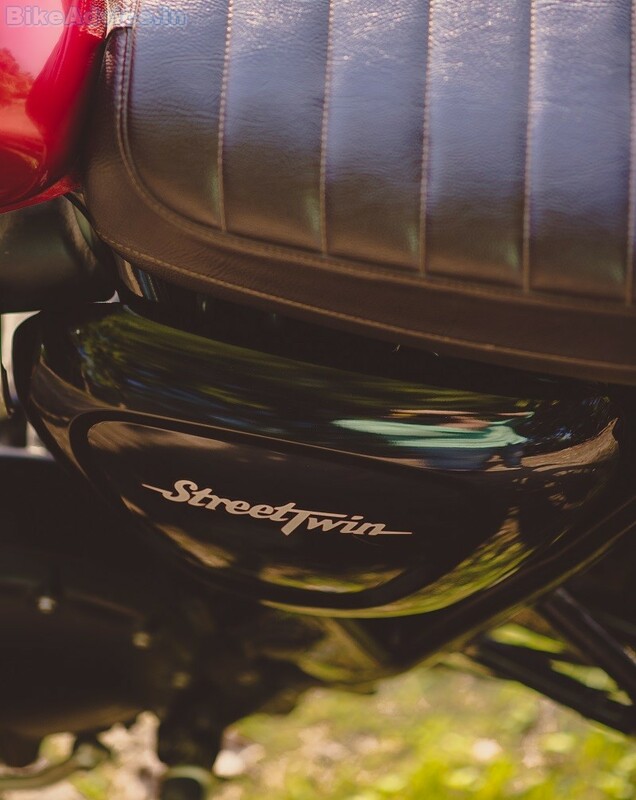 This engine is shared by the T100 as well, but somehow it’s in the Street Twin that it takes more visual prominence. 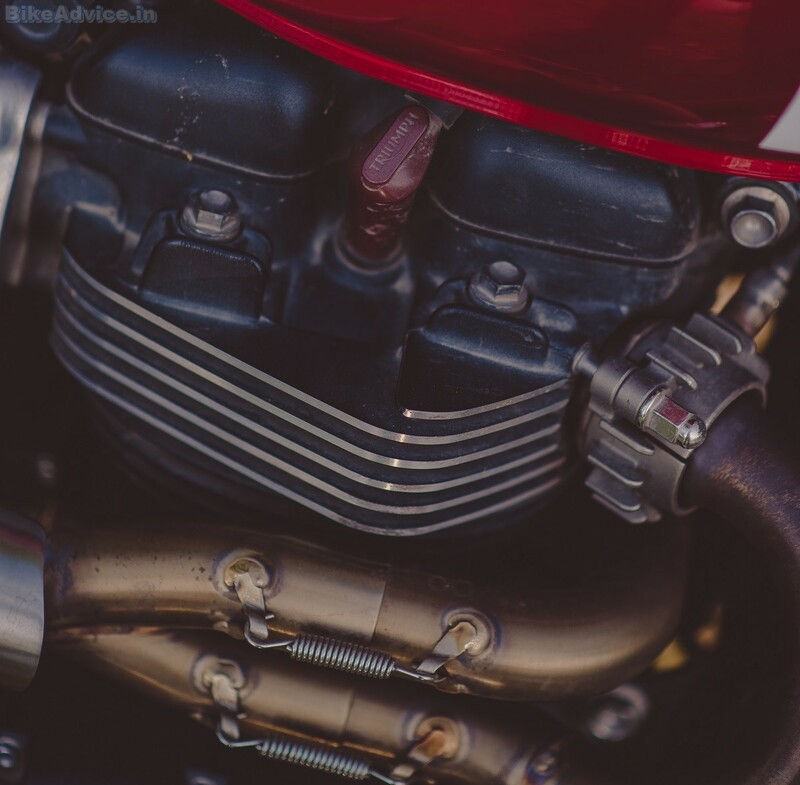 And even if engines are not your thing, you may still try looking up the classic Bonnies; you might then be able to see that despite being thoroughly modern, how closely matched the new engine is to theirs, design wise – that’s exactly how you do a modern classic. RE should learn from them. 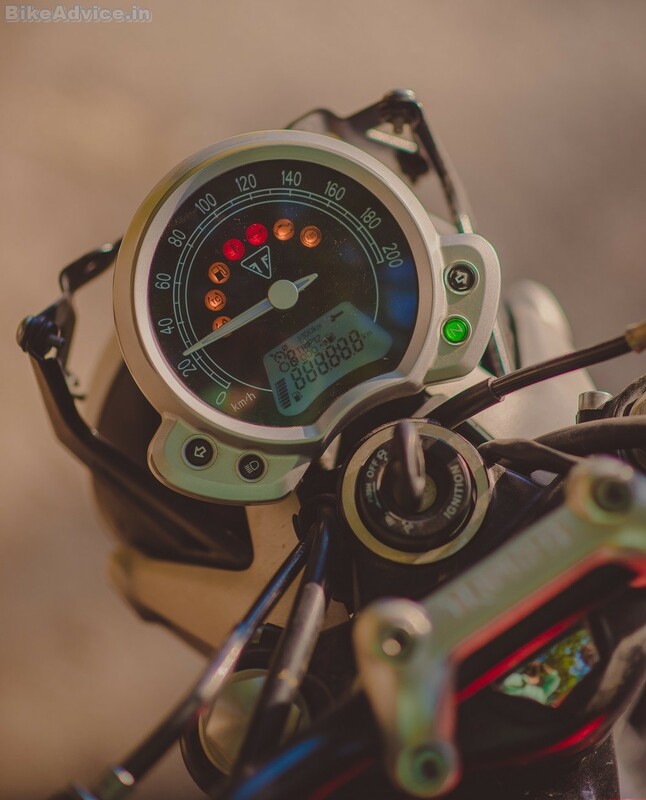 A zillion tell-tale icons light up, and so does your face; the speedo needle does the full customary swipe, and gives you a thumbs up, while the electronics digits along with the various signs and symbols in the LCD get into a frenzied hustle for a few seconds before taking their respective places, and then they stay still, almost looking at you with bated breath to push that starter button. You do it, and the 900 cc parallel twin wakes up with a bassy growl and settles into a smooth idle. 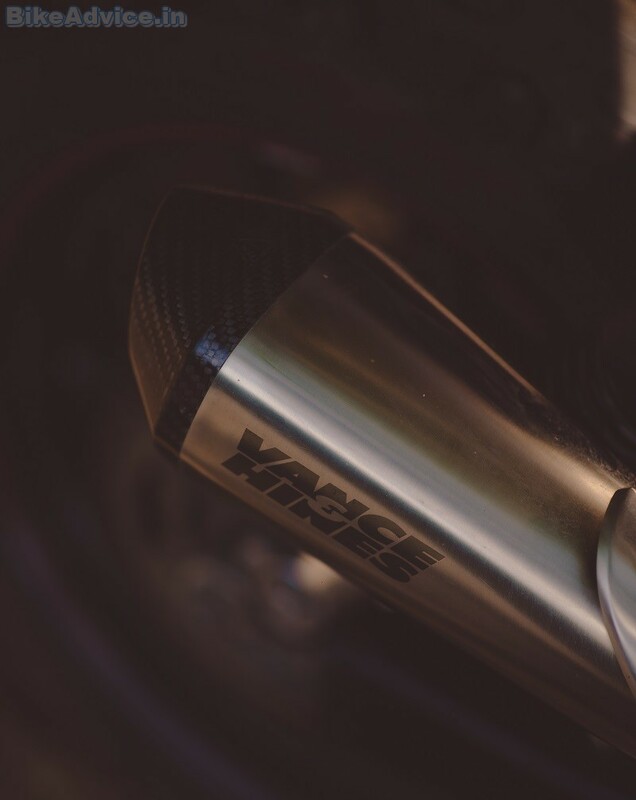 You pull in the light clutch, press down on the gear lever to engage first, blip the throttle a couple of times to check if Mr. Vance and Hines are willing, and half-dump the clutch. The rear Pirelli spins and steps out a little making that lovely screech before traction control reins it in and forward progress ensues. 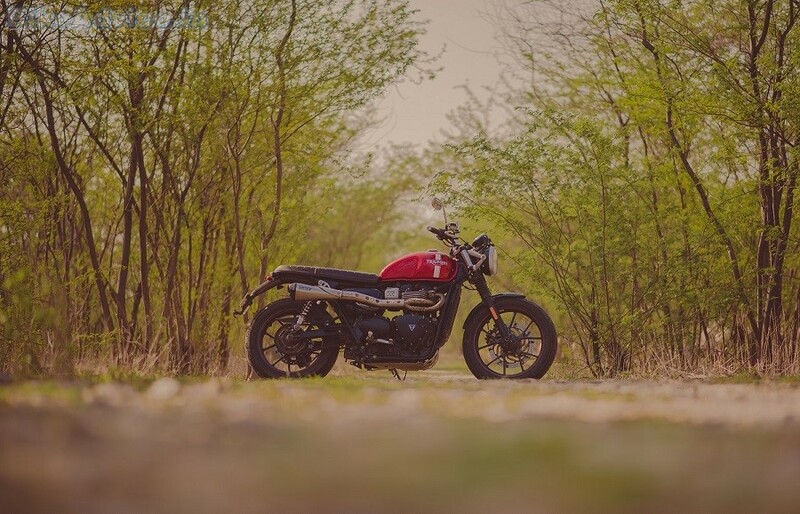 The best part is that both the motorcycles, the Street Twin and the T100, are zero-vibration bikes. Yes, you read that right. There are absolutely no vibrations till 140-150 km/h and even post that whatever hint there might be, it’s faint enough to not even get considered. 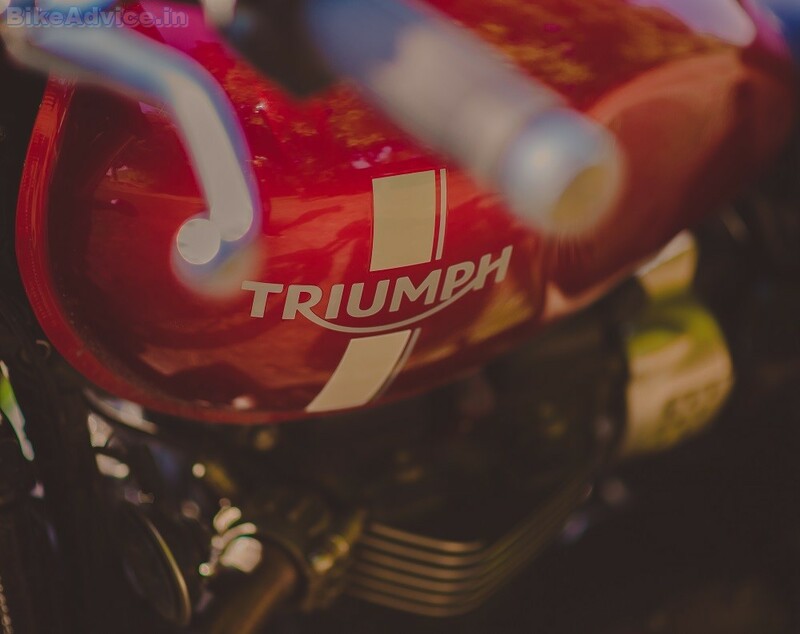 But don’t for a moment think that the bikes have become soulless; that’s something no Triumph will ever be! The engine might have become ultra-smooth, but you can still FEEL its heartbeat. But, thankfully, that’s where similarities end between both motorcycles. Because, if the Bonneville T100 is a suave, handsome, and responsible man, the Street Twin is his naughty younger brother. And being younger, he has even better reflexes too. I checked both their spec sheets after returning the Street Twin, which confirmed my seat-of-the-pants judgement. Not only is the steering geometry of the Street Twin sharper than the T100’s, its wheelbase is also shorter than the latter by 35 mm. These differences would appear zilch on paper, but you would know what they translate to in the real world when you ride both the bikes back to back. I was fortunate enough to get that opportunity and there is not an ounce of doubt that it’s the Street Twin that’s a better handling machine. The difference isn’t much, but it’s there. The turn-ins are quicker on the Street Twin and the bike just feels small enough to make through those gaps that you’d dare not take on any other big-capacity motorcycle. 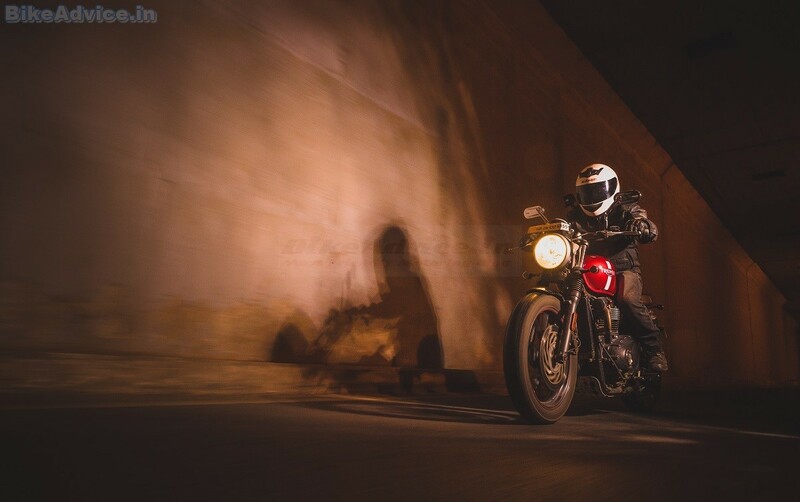 The Street Twin’s straight line stability is as good as its elder brother’s, and so is the braking performance and tyre grip as both the bikes get exactly the same rotors, calipers, and tyres. I kept this bike long enough to ensure I encounter situations that any prospective owner would, such as a cow on a Red Bull (no pun is intended as it may get you lynched) in the middle of the road, or a two-legged specimen with the same level of intellect, and under an even stronger influence, taking a sudden U-turn in a posh car without troubling the indicator stalk for even a moment, and many more, but, thankfully, the good brakes (and ABS, of course) saved me from becoming a part of history every single time. Thank you, you lovely little big motorcycle. The ride quality, again like the Bonnie T100, is brilliant as the Street Twin carries the same suspension set-up as the T100. That said, with the Street Twin, I would recommend anyone over 100 to 110 kilos to adjust the preload on the rear suspension in case they find it to be too soft on a test ride. I reckon the top three hardest settings to keep everyone in the range of 80 to 140 kilos happy. The bike was at its softest setting when I picked it up and it stayed like that for a major part; I jacked it up to level 3 (just like I had done with the Scrambler) briefly to stiffen things up a bit and found it to offer the perfect composure in this setting for my weight. Talking about perfection, and the last part of the Street Twin review, it’s the fuel efficiency of this engine that has once again left me astounded! You might remember me declaring the T100 as the most frugal 900 cc twin in the world, but, sadly, the T100’s happiness was short-lived. 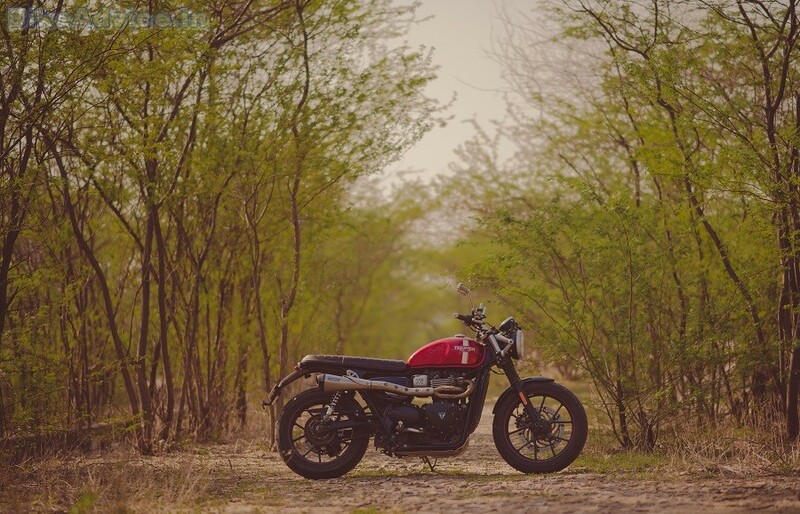 Because the Street Twin has trumped it by registering a stupendous fuel-consumption figure of 26.7 km/l! That’s unbelievable for you? Go jump off a cliff because it’s true. Triumph claim 27.02 km/l under ‘specific test conditions’, so I guess they should now be able to comfortably remove the disclaimer. What now? Still scrolling for a verdict? Okay, here it is then. See, the Street Twin might not have Bonneville in its nomenclature but it is as much a Bonnie as any other motorcycle in the Triumph’s new Modern Classics range, which is very much important for the traditional buyer. In fact, it has replaced the erstwhile Bonneville SE (now a hot favourite in the used Bonnie market) as the entry level Bonneville. But, it is a lot more than that now. And that’s something which is more important than tradition or heritage for new buyers. 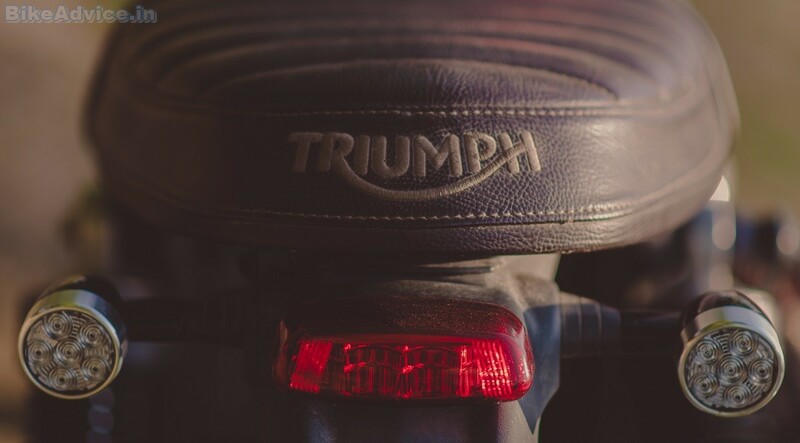 Thankfully, Triumph have got both kinds of buyers covered with this one. 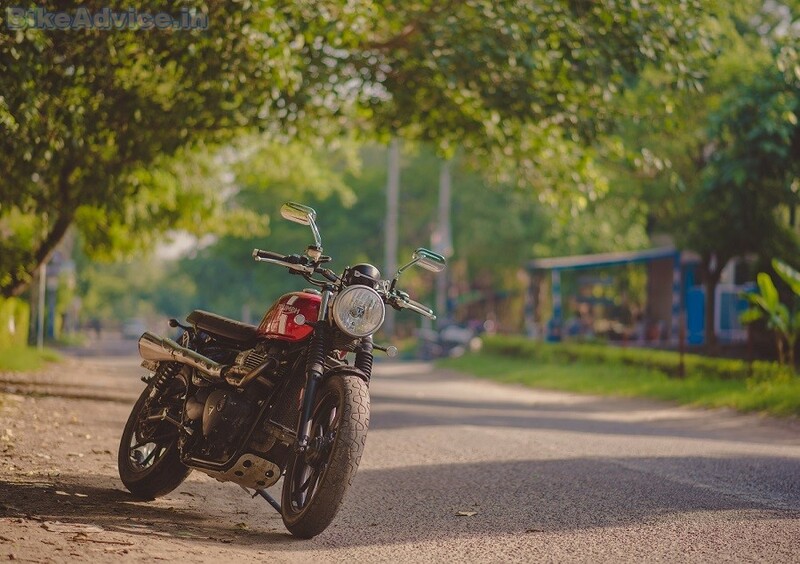 The Street Twin looks and feels like any Bonnie should; handles even better now; has a much, much improved motor that not only happens to be the best in segment but also better than a few from a segment higher as well; plus, that motor not only beats every other in the segment in arm wrestling (read: “torque battle”), it does so while sipping the least amount of fuel too! Now when was the last time you heard that? A price of INR 7,17,500 (ex-showroom, pan India, for the Jet Black Street Twin; you’ll have to shell out INR 12,250 extra for any of the other three colours on offer), ride by wire throttle, traction control, fantastic build quality, long service intervals, and an ever-increasing sales and service network (you may also add ‘enthusiastic and keen showroom staff’ to the list) just make the deal further sweeter. Wait a second! Does that price also make it the cheapest 900 cc motorcycle on sale in India today? I guess it does.